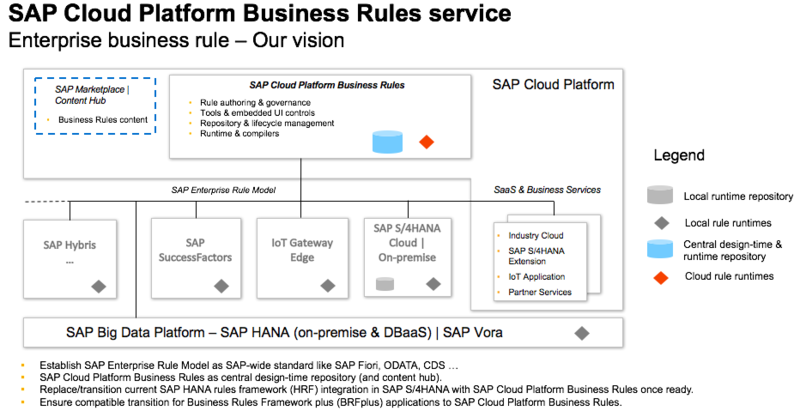 Business Rules has been the heart of different SAP Enterprise Applications starting with Business Rules Framework Plus(BRFplus) in NetWeaver ABAP, SAP Business Rules Management(BRM) in SAP Process Orchestration and HANA Rules Framework(HRF) in SAP HANA. While each framework had its own purpose we find an important demand in providing a common tool, technique of ideating, authoring, consuming and managing business rules in enterprise application. I am Ramana Mohanbabu, Chief Product Owner of Business Rules@SAP and i would be at SAP TechEd (Las Vegas, Barcelona) to share our vision of unifying Business Rules@SAP. Join me and my team next week at Las Vegas where we have planned an exciting series of Networking Session Lectures, Handson workshops and Mini-codejams focussing on Business Rules. Targeting developers, consultants, business process experts on understanding the basics of modelling and consuming business rules in SAP Cloud Platform using SAP Cloud Platform Business Rules. You would leave this session as Business Rules ninja able to precisely identify when and where to use business rules in your cloud applications. This talk targets developers, consultants, business process experts, architects who are jumping on to the IoT spectrum of problems. You will understand the different usage patterns of Business Rules in gaining insights from IoT data and how workflows are connecting people with these insights. In this lecture we would deep dive into 3 patterns of usage of Business Rules for extension applications. We would also share our roadmap and vision of SAP Enterprise Rule Model. This is a demo rich lecture session. Incase you would like to meet at TechEd Las Vegas use the Event Mobile App of SAP TechEd and ping me. Looking forward for an exciting 5 days. I am on my way to Las Vegas as I speak and I will try and find you to talk about this matter. I may have a Goat with me when I do. SAP has a horrible tendency to have about fifteen different products to address the same problem, and business rules falls squarely into this basket. Usually when someone asks SAP a straight question like :which one of the 15 should I be using” or “is BRF+ obsolete now?” back comes a flood of waffling all wrapped in the ever popular “it all depends” which translates to “marketing told me to tell customers that ALL of the 15 solutions are valid and do not bad mouth any of them”. That s not what people want to hear, they want to hear a clear “use this one”. I have found that when you get the “it all depends on your situation” response and then you grab the person who said that before they can run off and explain your situation in great detail they still won;t tell you which one to use. So I am looking forward to a straight answer, and the Goat is looking forward to saying “Bleat!”.